We have had the opportunity to test all kinds of gear from countless companies. We have tested a few pieces of Wolverine gear, including the bomber Pulsar Trail Shoes. 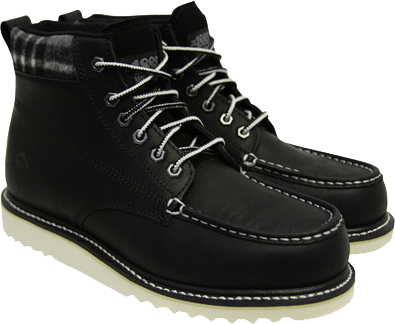 This time around we get to go down a less technical route and try out the street ready "lifestyle" boots, the Shindell. I could go on and on about how cold and miserable the winters are here in Minnesota. I won't do it to you again, promise. The reason I mention it at all is because boots are not simply a fashion statement 'round here. They are part of the winter uniform. You just can't leave the house in a pair of sneakers and expect that to be sufficient. For my average day, the sidewalk is as close as I get to a trail, so these will do nicely. As part of the No. 1883 collection, the Shindells take Wolverine's rock solid construction and blend together "tradition and trend". I liked just about every detail of these boots straight out of the box. The soft leather required no break in period. The micro fleece lining is soft and warm. The contrast stitching and plaid flannel cuff added just enough flavor to make them interesting. I have very few complaints. The white sole looked great initially, but has proven to be a pain to keep clean. I know it is being nit-picky, but the two-tone waxed laces refuse to stay tied, and it drives me nuts. So, when your hikers are overkill, these may be the way to go.